He has 36 years in the Industrial and commercial Electrical trade, He has completed some of the biggest project in south west mo. A little about myself. I went to work for an Industrial, commercial electrical company in Mtn Grove Mo and found myself working industrial work in the local steel plants for the next five years. Then I went to work in Springfield Mo for another commercial and Industrial contractor where I took care of a local rock Quarry and worked on waste water treatment plants. The early 90’s I went to work in Branson for a local contractor where I spent five years as the electrical foreman on theaters pushing a crew of up to 60 electricians. 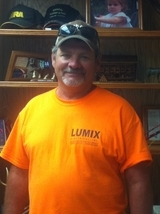 In 1997 I started Lumix Electrical Inc, It is an industrial and commercial contracting company in Rogersville Mo. 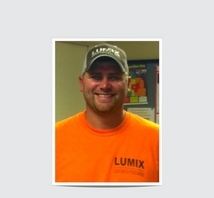 Six years ago Chris Smith moved back to Fulton and we started Lumix in our north location. I like to hunt, Fish and Scuba Dive, we like to ride ATV in the mountains and spend time with the Lumix family of Employees. Christopher Smith is also a licensed Master Electrician with Springfield, Columbia, Jefferson City, Missouri. He has 15 years experience in the electrical trade. He has completed some very large automated production lines and production plants in and around Springfield and Fulton, Missouri. A little bit of about myself. My career start was a Construction Electrician in the Navy Seabees. Furthering my career after the Navy was making a start in the Maintenance field in food processing plant. Now I’m a Licensed Master Electrician with Springfield, Columbia, Jefferson City Missouri. I have 13 years of experience in the construction field involved in completing some very large automated production lines and commercial projects in and around Springfield and Fulton, Missouri. For the past five years I have been General Manager of our Fulton, Mo location. After hours my family and I enjoy camping, boating, riding ATV’s, skiing. Richard Magruder is the General Forman for the field work for lumix Electrical work and I oversee much of the commercial contracting. I am also the industrial equipment mover; I will move equipment, build work stations and erect gib cranes, along with relocating the electrical. If you need the equipment brought from another state I can arrange that also and if you want to bring it in yourself I can off load it and place it in your plant for you. I like Scuba diving, fishing, hunting, four wheeling and spending time with family and friends. Judy Magruder is the Book Keeper and Tax preparer for Lumix Electrical. Kathie works part-time in the Fulton North office handling day-to-day office paperwork. She has been with Lumix since August 2009. After approximately 30 years with the State of Missouri, Kathie retired to care for grandchildren when they are sick and transport her parents to their doctor appointments in addition to working three days in the Lumix office. Kathie’s main hobby is bowling at Fulton’s local bowling center.